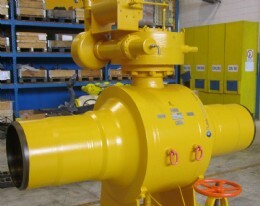 The order was for customised heavy-duty gearboxes to operate 450mm (18") Class 600 subsea ball valves at a depth of 130 to 150m (460 to 490ft) in the Zawtika oil and gas field in the Bay of Bengal. The Rotork WGS range of quarter-turn gearboxes are designed for heavy-duty subsea applications and constructed with carefully chosen materials to offer the highest level of reliability in very harsh environments. The customer specified that the model WGS550 gearboxes should be built with a special vertical input structure with a total height of 750mm, capable of sustaining 3,000Nm of bending moment force and a vertical axial load of 3,000N. The design has been validated by Rotork Gears, using a Finite Element Model (FEM) software simulation that predicts how a model reacts to physical effects, followed by a Mechanical Advantage (MA) test on an in-house test rig to confirm the efficient performance of the design. The gearboxes can operate the valve by using a Class 2 Remotely Operated Vehicle (ROV) or a removable handwheel used by a diver. To avoid damage to the valves the input torque is limited at 170Nm. For added security, special handwheels with calibrated Duplex stainless steel shear pins have been supplied and a highly visible operating data plate is attached next to the ROV bucket on each gearbox. Completed valve and gearbox assemblies tests were performed in a hyperbaric chamber, simulating an external pressure of 27bar (around 1.8 times the required pressure). Econosto UK to Stock Latest ECON Products: Econosto UK Ltd, which started life as Ball Valves UK in 1984 continues to grow in more ways than one.